I’ve had success letting the glue dry about 90%, then scraping off the squeeze out with a sharp chisel. out can be scraped off when dry. Without sacrificing the integrity of the joint is there a way to get it so all the squeeze out is on the back side of the piece rather than the face? Stain it first then glue it? Even scraping will smooth your rough sawn surface somewhat. Hide glue can be completely cleaned up with only water and won’t block your stain if you get it all off. Unless it is for outdoor use where it will be subject to soaking it might be your best bet. Old Brown Glue will give you lots of open time. Shipwright has a good point about hide glue. The thought of staining it before glue up had never even occurred to me. Could be a big risk big reward type thing. I suppose if I have any glue on top and have to remove I can do some stain touch up. Has anyone stained before gluing up before? I don’t think I’d let glue get completely hard before trying to scrape it off. I know how I work and I have a feeling I’d get quickly frustrated and mar the surface. It will be an indoor project, so no worry about water and its a pretty small glue up (only two 3’ long edge joints) so I don’t need a crazy amount of working time. I’ve never used hide glue before. Is that different than the plastic resin that Loren suggested? What would be the reason I’d want to use one of these over Titebond II? If you can tape it carefully enough, then the squeeze out will lift off. Also, Loren’s suggestion for plastic resin glue is good, not only because it cleans up easily, but it’s much more stain friendly than PVA. If you get right on it after glue up with a sponge and bucket of warm water you’ll be all set. I use DAP Weldwood. It comes as a powder that will keep indefinitely, and all you do is mix it with water. I usually use more glue than the directions say to get a thicker result that doesn’t run as much. Another great choice would be liquid hide glue. It too is very stain friendly and it will wash clean with warm water even after it dries. Of all of them, I most highly recommend liquid hide glue. I make my own, but if you’re going to use it, get Old Brown Glue. It’s the real thing, just hide glue, urea and water. Edit: I was typing when Paul posted his LHG recommendation, but he’s right. It will solve your dilemma. 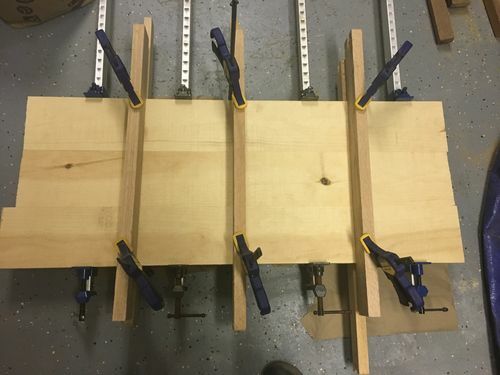 Since I am going to have to lay the project flat on the floor since my bench is too small I’m thinking that if I lay it with the rough face down then the glue will drip onto the floor rather than pooling up if I were to have the rough side facing up? Also how tight should I really be clamping. I don’t have a jointer so usually I am clamping pretty tight to get the joint as seamless as possible (I don’t usually use anything this wide so not sure if it will be more or less of an issue), but as you crank down it usually causes more glue to seep. I don’t want the joint to fall apart (though it will have little stress on it over time), but maybe I don’t actually have to go that hard to still get something solid? Liquid Hide Glue. I use Titebond (which is readily available), but Old Brown is fine, too. I have a nice rip blade that really does seem to give me a glue ready edge. I dry fit to make sure, and re-rip if necessary (though it almost never is). Usually, I coat one edge down the middle and spread evenly with a brush. The I rub the two edges together and clamp it up. For me, the trick is always keeping the faces even while clamping. Show side UP, light clamp, then go back to each clamp in sequence and press down the high side and tighten a bit ‘til the glue seems to quit oozing out (don’t need to be all THAT tight). You’ll have loads of time (45 minutes), so don’t worry about moving fast; its worth spending the time to even up the faces. I always clean up glue squeeze out right after clamping with a damp rag. It ain’t gonna dilute the glue IN the joint. I do let it stay in the clamps at least over night. With the clamps off, I use a wet-ish rag to wipe off any remaining glue; just rub a moment or two and it’ll come off. Now, the backside may still need some sanding to even up the faces. With rough-sawn, thickness probably isn’t consistent for the whole board. Show side is what matters, right? I wouldn’t use anything but hide glue (OBG for open time) on it in that case. Hide glue is a great idea and I would very carefully apply glue to only the back half of the joint to minimize squeeze out on the front side. I am still missing the point of what about the hide glue is going to give me an advantage over TB2 besides open time. Also does anyone have any suggestions as to local stores to get Titebond Liquid Hide Glue? Home Depot and Lowe’s don’t appear to sell it. I have Woodcraft, but its not that close and would prefer not going out of the way. I can actually order it in through my store, but it will take about a week to come in, and I was hoping to glue this weekend. One other thing I thought of that may help with a lot of this is to do a shiplap joint on the boards rather than the square edge. That would help with keeping glue on the back side of the joint. I could also do it with a nickel gap between the planks which would help minimize any level differences between the planks (Though I think I’d prefer not to do this). The final size of the project really doesn’t matter so I am not worried about losing a little bit of surface to the joints if it makes the glueing and finishing easier. Also does anyone have any suggestions as to local stores to get Titebond Liquid Hide Glue? Advantage of Liquid Hide Glue is cleanup. AFTER the glue has cured, you can STILL clean it up with a wet rag and rubbing. You can’t do that with regular Titebond (or 2 or 3). With Liquid Hide Glue, you don’t have to sand or chisel or scrape away any excess dried glue; just rub with a warm wet-ish rag. My Ace has the Titebond Liquid Hide Glue. Oh that is a a big advantage. Normally you might care about the grain raising, but since its already a rough surface than no big deal. Will those spots show up differently when stain is applied? I pass by an Ace hardware on the way home. I’ll check with them. What about using cabinet bolts to join them together Ben? They’ll pull that joint together as tight as anything ive used. Realistically, I’d just use painters tape on the front side and not over-glue it. Cabinet bolts might be a bit more than I feel like doing on this project. I’ve used pocket screws before, but once I got a biscuit joiner I stopped since (even though its the back) they look a lot cleaner and are a lot cheaper. Though on this project that might be a good solution and just to a LIGHT coat of glue. The ship lap is a good idea. If you’re using a coating like poly, finish the boards before glue up. Another option would be coat the boards with something you can take off later like wax. In my (limited) experience with hide glues, between TB and Old Brown Glue I prefer the OBG. Bottom line I with a combination of the ship lap and a coating, you can use wood glue. Hide glue wil not block your stain or finish if you get it all off. If you don’t, it will block just like other glues. The difference is that you can get it all off with just water and not have to sand your rough sawn surface. For a “breadboard” type glueup, a simple trick to avoid squeeze out is to run a shallow saw blade kerf along the length of the glue surface, close to the “show” edge. Don’t go overboard on applying the glue and keep the surface between the show face and kerf glue-free. The kerf will form a pit that any excess glue will seep into before squeezing out onto the show face. If you don t, it will block just like other glues. That doesn’t comport with what I’ve read, and with my personal experience. Often, we will glue up pre-surfaced boards, then “strafe” the face on the bandsaw to resurface it to the desired rough sawn texture. We even keep a blade with a couple selected teeth bent out of camber to create a slightly rougher texture when desired. That doesn t comport with what I ve read, and with my personal experience. Paul, you’re doing glue ups that are infinitely more complex than anything I do. Just for fun, I ran a bead of my homemade LHG on a board and smeared it out with my finger — far more glue than I’d ever leave on a piece. A couple of hours later, I wiped some gel stain on and the glue area was barely discernible. I’ll just say it’s far more stain friendly than PVA and call it a day. A trick I learning from my father (he was a cabinet maker before WWII) and I’ve had pretty good success with is ploughing a 1/16th (ish) groove about 1/16 below the edge (I use a scratch stock). It gives the glue a place to go. Let he glue tack up too. I ended up going far more basic with my approach to it and it turned out well enough. I did a very shallow groove in the edge of each joint just below the surface and glued using TB3. I would have used liquid hide glue, but couldn’t find it anywhere nearby and didn’t want to wait to order. I was worried that maybe I used a too little of glue but so far seems to be holding well enough and I think it will be fine long term since it isn’t going to be moved or stressed at all. Using the clamps and the cauls I got it pretty flat – certainly flat enough for some rustic artwork. I am going to stain it today and we’ll see how it comes out but since I didn’t have any glue on the surface I think it will be fine. Definitely may employ this strategy in the future. It works like a charm. Glue will not stick to it and it removes easily so that the final finish will stick to the wood.